This allows you to set the radix (base) in which results are displayed. The default is decimal. If you select “Octal” or “Hex,” Mathcad truncates the number to an integer and displays it as octal or hexadecimal. Hexadecimal results are indicated by the letter “h” after the number, octal results by the letter “0.” (Mathcad does not reliably show hexadecimal or octal numbers of magnitude greater than 231 ,or about 2· 109). for more information on how to type complex numbers. 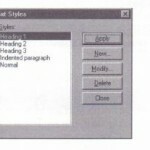 Check this box to suppress the use of scrolling output tables. Vectors and matrices having more than nine rows or columns are displayed as scrolling output tables unless this box is checked. 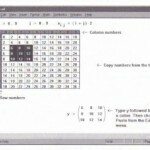 See the section “Displaying vectors and matrices” in Chapter 10 for more information on scrolling output tables. Check this box to make all displayed results have as many digits to the right of the decimal point as required by the current choice of Displayed Precision. 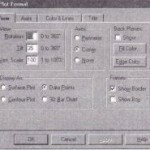 For example, with Displayed Precision set to 3, Mathcad displays 5 as 5.000. Enter an integer between 0 and 15. This indicates how many decimal places to show in computed results. The default is 3. Numbers are rounded for display only. Mathcad maintains 15 digits of precision internally. Enter an integer n between 0 and 63. If the ratio between the real and imaginary part of a complex number is less than Ion or greater than lo-n, then the smaller part is not shown. The default setting is 10. This means that numbers like 1 + 1O-12j :Will appear simply as 1. Mathcad rounds only the displayed values. No change is made in the internally stored values. • Click anywhere on the result. 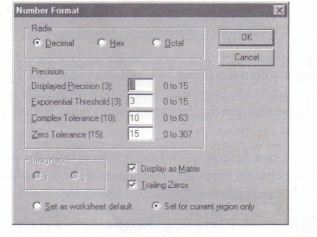 Mathcad displays the number in full precision on the message line at the bottom of the application window, as shown in Figure 6-1. Figure 6-1: Full precision is maintained internally. • Click anywhere in the equation whose result you want to format. • Change the desired settings. See the section “Setting worksheet default format” on page 118 to learn what the various settings do and what their allowed values are. To display the six decimal places shown below, you would change “Displayed Precision” from 3 to 6.